Imperial Japanese Post Office in Tsingtau, China. Tsingtau (now Qingdao) is a port city on the Yellow Sea southeast of Beijing. 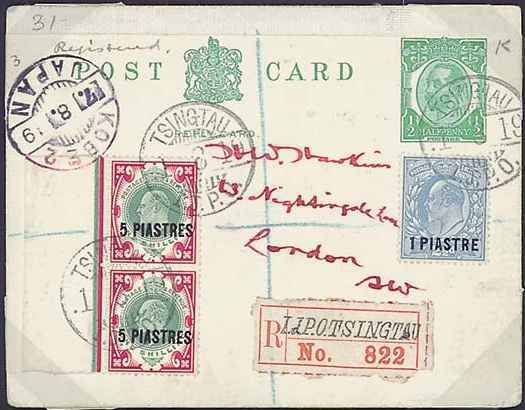 issued for use in British Post Offices in the Levant (referring to the Turkish Empire). overprinted 1¾ PIASTRE for use in Constantinople (SG 23a.). The British Post Office in Constantinople was opened September 1, 1857. It closed September 30, 1914, as a result of World War I. The Post Office was reopened February 4, 1919 and closed finally September 27, 1923. Japanese Post Offices were operated in China from 1900 to 1922. I cannot explain why these stamps would be accepted in the I.J.P.O. Was it because any stamps could be used there? The card has two nice strikes of the Tsingtau CDS. with a pencilled blue cross and a preprinted registry label. One wonders what would have led to registration of a reply card? Was the message something like, "I can't be at the board meeting."? The card transitted Kobe, Japan, on August 7. Unfortunately, the reverse is unavailable so any other transit marks are not available. Jim Whitford-Stark found the mate to this reply card. The mate was offered in the Cavendish Auction of April 12, 2002, as lot 293. 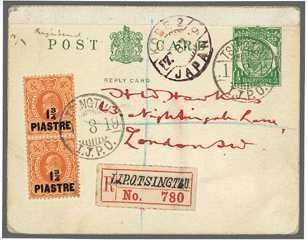 JAPANESE POST OFFICES IN CHINA- REMARKABLE USAGE OF BRITISH LEVANT ADHESIVES ON ½d POSTAL STATIONERY CARD: 1919 registered ½d postal stationery card addressed to London bearing BRITISH LEVANT 1pi & 5pi (2) adhesives tied by "TSINGTAU/I.J.P.O." datestamps of 1 August. Tsingtau I.J.P.O. registration label and Kobe transit d.s. A truly bizarre item! The suggested price for the postal card was £750! Interestingly, the serial numbers of the registration labels are neither sequential nor even near. As Jim suggested, the item probably has a philatelic intent. provides more tidbits about stamps and collectors. Please include a reference to this item.